You combine the recent string of success over its in-state rival with consecutive seasons ranked in the Top 5 and back to back bowl victories over quality BCS conference opponents, you would think that the Spartan faithful would no longer be concerned with what is going on in Ann Arbor because they ran the state of Michigan. The Michigan State players recently received their championship rings from the epic Cotton Bowl Classic victory over the Baylor Bears and for whatever reason the rival Wolverines were on the minds of the Spartans when they designed the ring. MSU is better than this… at least I thought it was. Why was it necessary to put the name and score of a game you dominated on a bowl ring that did not involve them? The team is starting to gain national recognition for its play on the field and because of that the pendulum of fan allegiance within the state of Michigan is swaying hard in the Spartans direction. For years the state bled maize and blue when it came to choosing a side, but recently there has been an influx of fans growing up choosing to root for the Spartans over the Wolverines. What does this say to Spartan fans everywhere about the team’s ability to rid itself of a perception that it came so close to overcoming? As much as Wolverines fans used to love yelling the “little brother” moniker at Michigan State, you have to wonder how many people wearing Spartan Green actually started believing it. Little brothers lurk in sibling shadows for so long that even when they do well its still hard not to look to the older brother for affirmation. 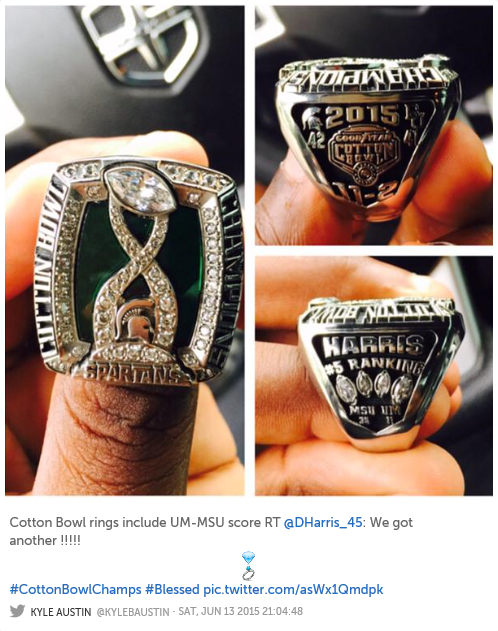 And even if Spartan fans will never admit it, despite the recent run of success in East Lansing, MI, MSU still uses U-M as a barometer of having “made it” — and putting your big brother’s name on a ring you earned is another cry for attention. There is no way Alabama would put Auburn on a bowl championship ring. Florida State would probably rather not accept a bowl ring if it meant it had to acknowledge Miami or Florida on it — so why did anyone think it was ok to create a piece of jewelry with the U-M name on it? The irony of this bad decision is that members of 2014 Michigan State football team will now have to walk around for the rest of their lives wearing a ring with the name of its bitter rival on it. With the hiring of Jim Harbaugh, many believe that the rivalry could eventually swing back in the favor of the Wolverines and just to think this could very well be one of the last times the Spartans get a bowl championship ring of this magnitude and each time the look down to reminisce over it, they will see the Wolverines trolling them.